Once seen as an escape from the city, a meal among the trees and meadows is now a journey to the past. An Object Lesson. Once upon a time, every meal was a picnic. Then people got roofs and things. Eventually, they set about inventing an occasion to revisit that rustic past. The industrial age transformed the al fresco repast into an escape from the strictures of increasingly urbanized life. The picnic became a pleasure excursion to places that were once survival’s battlefield. For 250 years, the picnic reigned as a premier entertainment for wide swaths of society. In the process, it inspired nostalgia, tested the boundaries of morality, and became a cottage business. Today, the picnic persists. But in large part, it has become a cultural memory instead of an activity. Romanticism was the aesthetic consequence of the Industrial Revolution’s changes to social and material life. The movement reappraised nature, helping shape picnics as a cultural fad. In the hundred years after 1750, the population of England nearly tripled, and by 1850, half its population lived in cities. What had previously seemed like a unified world started to divide between city and country. I doubt any farmers would think it remotely delightful to spend Sunday eating from the ground over which they labored the rest of the week, but nevertheless city-dwellers began idealizing that practice as a return to nature. By pleasure of corporeal appetite. Jane Austen, too, would set a transformative scene in her novel Emma during a picnic, another early incidence of what would become a longstanding trend in art: the country outing as a figurative journey to revelation. Treated sentimentally as well as allegorically, the picnic was a frequent subject in painting, too, especially during the 19th century. French painters Pierre-Auguste Renoir, Claude Monet, and James Tissot all took on the subject. 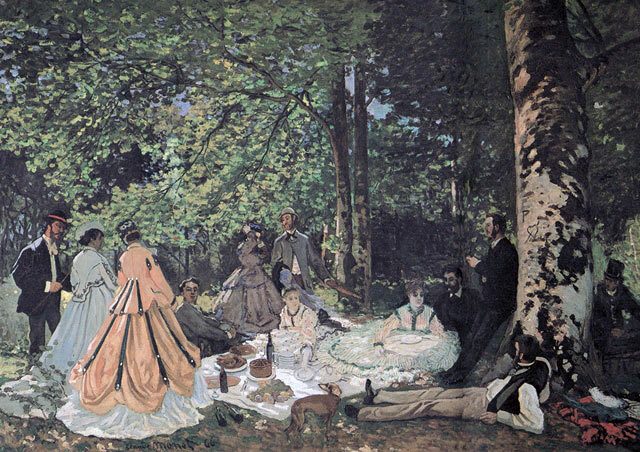 Manet’s 1863 Le déjeuner sur l’herbe is probably the best-known picnic painting of all—not in small part thanks to the fact that it suggests picnics lure women to disrobe. The picnic had found its moment. Culturally and aesthetically, it represented the passage from one world to another. Baskets and blankets crossed bridges both literal and figurative, from dense manufacturing centers to bucolic pastures overlooking river or lake. In so doing, oppressive social expectations gave way to nature’s inhibition—and humans’ half-wild nature. It’s a common narrative pivot, with the picnic as a fulcrum: the spontaneous tryst in the shrubbery during an innocent excursion to the countryside. In Guy de Maupassant’s 1881 short story “Une Partie de Campagne,” a character mimics a satyr as he chases another whose clothes mysteriously loosen the farther she gets from Paris. Then there is William Inge’s Pulitzer-winning 1953 play Picnic, in which a small-town Labor Day gathering incites carnal events that change three women’s lives. And in Peter Weir’s 1975 film, Picnic at Hanging Rock, set in 1900, a simple lunch in the Outback is enough to lure girls on the cusp of womanhood into the wilderness of their own voracious desires, trailing pieces of attire as they go. No wonder that, by 1912, The New York Times reported that the “selection of a chaperon” was one of the main problems in arranging a picnic. In America at the turn of the 19th century, the picnic presented new opportunities for commerce. Urbanization increased, and with it the desire to escape the city. Enterprising individuals bought especially scenic parcels of land—water frontage practically mandatory—and set up for-profit picnic groves. Picnic wagons, and later trolleys, made runs from the center of town. The screaming, thumping, paved-over acreage that is now Six Flags New England, near Springfield, Massachusetts, sits atop the final resting place of another picnic ground, Gallup’s Grove. It had been situated among the white pines alongside a meadow stretching picturesquely to the Connecticut River’s banks. Picnickers arrived on steamboats from the City of Progress to enjoy clambakes on the grounds. In 1911 the picnic grove was rechristened an amusement park. The picnic as universal entertainment was starting on its way to superannuation, in favor of faster diversions. Anne was glad, for she likes picnics. To picnic was to experience the giddiest of expectations: the collision of known and unknown. Beating the risks of nature with Swiss army knives and checkered cloths was practice for the elemental test that humans evolved to master. But in no time, it seemed, we had tired of the quiet pleasures of shadow-boxing with the natural world. How hopelessly quaint to think of setting out on a car trip armed with sandwiches and coffee on a morning’s drive through foodless landscape. Now the highway tempts the traveler with one long fast-food oasis running for 3,000 miles. My father reported the happiest moments of growing up during the Depression were when his mother packed the hamper and the family drove from the rubber-factory-darkened skies of Akron into the sweet air of the country. They had no destination in mind. When a particularly comely pasture appeared, they stopped. Their picnic was spread on a farmer’s hayfield, then essentially a commons, no permission required. The picnic, of course, has not entirely vanished. Instead, it tends to occur as self-conscious retro entertainment, like many a necessity of yore. The desire is burnished either by youth and its eternal quest for ownership of others’ discarded memories, or by money. The concert in the park brings forth the candelabrum and wineglass and saucisson; Rolls-Royce’s bespoke hamper, made of saddle leather, oiled teak, and polished aluminum, comes complete with Hungarian hand-blown crystal and Wedgwood porcelain. It fits perfectly into your Phantom Zenith to provide a memorable meal, for only $46,000. The Bentley Bentayga’s version—with refrigerated compartment!—is a mere $32,000. If a water view is more to your liking, the Hinckley Picnic Boat MKIII offers a floating picnic. If you can lay your hands on one of the 450 made so far. For $750,000. I have not made a picnic in years, not the kind where I consult the Bible of my youth, Bach’s Lunch: Picnic & Patio Classics, from the Junior Committee of the Cleveland Orchestra. Not the kind that is the highlight of any week, a dream made real: a vacation to the faraway that may be only a few miles but feels like a heady adventure. The fate of this inimitable event—ants real or apocryphal, lemonade, and all—is a cultural bellwether. The arc of its rise and fall charts our changing relationship to the rural landscape, and to our past. It may be temporarily gone, but you can call it back. What is left of the uncharted, unmapped, unfathomed still beckons. And don’t forget the mayonnaise. Melissa Holbrook Pierson is the author of five books, including The Place You Love Is Gone.